A Media Advocacy Workshop on the upcoming Measles Rubella vaccination campaign was held at the DCr’s conference hall in Hailakandi, Assam on Thursday . 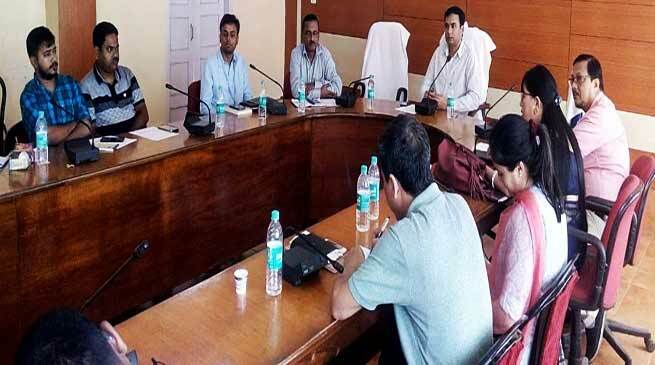 Deputy Commissioner, Hailakandi, Adil Khan sought the unstinted support and cooperation from the media to create awareness among the people so that no child is left out of the month-long vaccination campaign beginning August 17. Khan said the media must dispel doubts or misgivings in the minds of a section of the people regarding the MR vaccination and to drive home the message loud and clear that the vaccine is highly safe and helps to boost the immune system. He said all out efforts are on to gear up IEC activities and to meet cross sections of people, including religious and political leaders to make Hailakandi district free from Measles and Rubella diseases. The Deputy Commissioner said plans are on the anvil to bring out rallies, street plays and other interactive programmes to create mass awareness on MR to ensure total involvement of all stakeholders. Joint Director, Health Services, Dr. Avijit Basu said the role of the media is of vital importance in ensuring success of the MR vaccination drive. “Media can play a vital role in disseminating information on MR and motivate the people to take part in the vaccination in a big way. It can prevent rumours and dispel apprehensions by spreading the message effectively,” said Dr. Basu. Speaking on the occasion, District Immunisation Officer, Dr. K. Thambalsena said the MR campaign would target 2,16,318 children aged 9 months to 15 years. Altogether 2,198 sessions are being organised in schools, outreach, fixed and high risk areas. 1,242 vaccinators, ASHA workers and supervisors would be pressed into the vaccination drive across the district. 16 Adverse Events Following Immunisation (AEFI) management centres have been set up manned by senior doctors and health functionaries to deal with emergency cases. 108 ambulance services would also be available. Members of the media also put forth valuable feedback and suggestions for making the MR campaign meaningful and effective. A 10-member District Level Core Committee on Measles Rubella Vaccination Campaign for Media Management was formed headed by Deputy Commissioner Khan. It was decided to hold the central launching programme at Blue Flower School in Hailakandi town on August 17. The workshop was attended, among others, by Additional Chief Health and Medical Officer, Dr. Abed Rasul Mazumder, District Media Expert, Monika Das and District Information and Public Relations Officer, Sabir Nishat.